George Harrison proposed to model Pattie Boyd the first day they ever met. Paul McCartney was convinced that someone else had already come up with the melody for "Yesterday" -- only to soon realize the tune had actually poured out of him. And the first song Nile Rodgers ever learned to play on the guitar was the Beatles' "A Day in the Life." Those were just some of the revealing bits that came out of CBS News, 50 Years Later...The Beatles at The Ed Sullivan Theater: Presented by Motown The Musical, a live multimedia event held Sunday night at the Ed Sullivan Theater in New York. The star-studded symposium, hosted by "CBS This Morning: Saturday" anchor Anthony Mason, coincided with the 50th anniversary of the Beatles' debut performance on "The Ed Sullivan Show." It examined the lasting cultural and musical impact the Beatles had with the help of several high-profile music and cultural experts whose work has been influenced the band out of Liverpool, England. 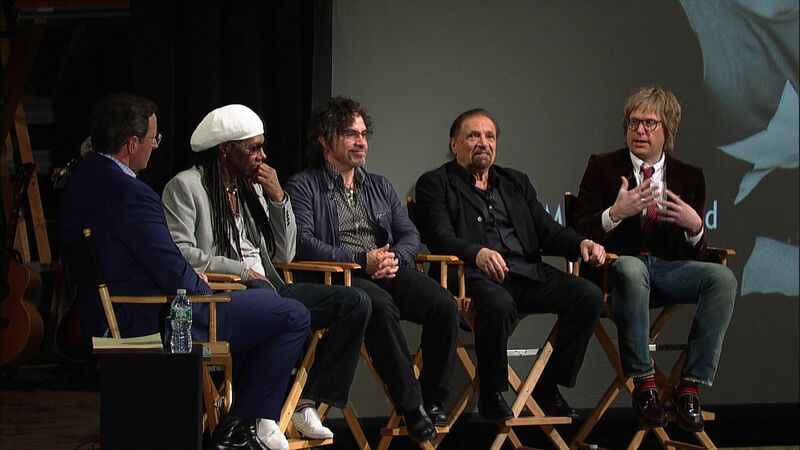 In addition to Rodgers, the panel featured guitarist Tad Kubler of the Hold Steady; John Oates of the hit-making duo of Hall & Oates; "Monty Python" collaborator Neil Innes; Pattie Boyd, a photographer and model who was once married to Harrison and served as the inspiration for his song "Something"; record producer and founding Foreigner member Mick Jones; Felix Cavaliere of the Rascals; filmmaker Julie Taymor, who directed the film "Across the Universe"; and producer Peter Asher, whose sister, actress Jane Asher, dated Paul McCartney. Each guest speaker spoke about the impact the Beatles had 50 years ago -- and how the Fab Four still inspires musicians today. Jones, who opened up for the Beatles in the early '60s in Paris, remembered hearing the band for the first time: "I was just dazzled I heard on side of the stage and first night I saw them it was like a white light experience," he said. "There was like an aura around them they played for a full forty minutes 15 songs in that time. I wish I could get away with that." "It's amazing they created this whole body of work in six or seven years. I don't understand that. Well actually I do. But they were so prolific and so profound," Oates said. Asher recalled that prolific nature when McCartney first wrote "Yesterday." "I wasn't there that day...he showed it to my mother first...he thought he stole if from someone and kept asking what this is. And realized he came up with it," he said. "You know when someone has their eye on you," she said. "We sat next to each other at lunch. We started talking, I don't know, maybe he was telling me about America. He asked me to marry that day, they were so funny and playful and you never knew if they were taking anything seriously. I thought this is part of his joke." Once the symposium wrapped, several of the performers, including Jones and Kubler, hit the stage to for an impromptu rendition of "All You Need is Love," while the crowd sang along -- a fitting way to end the night. Check out the videos above for highlights from the "50 Years: The Beatles" event and watch the event in its entirety at CBS Local.